When I was studying for my Diploma Sake Sommelier exam in Tokyo nearly ten years ago, I remember thinking how similar it was to learning about wine. I memorized the key Japanese words that are indications of quality and style on a sake bottle: Tokubetsu means special; koshu means aged sake; honjozo is a sake style where a small amount of alcohol has been added; its opposite would be junmai, which indicates no alcohol was added. Honjozo requires that the rice be polished so that no more than 70% of the original size of the rice grain remains. Among the numerous terms to remember about sake, two stand out as being among the most important: Daiginjo and ginjo, which indicate the polishing requirement amount and quality. Daiginjo means a minimum of 50% of the outer layer of the rice has been polished away leaving behind the best part, the heart (shinpaku) of the rice to make sake. Ginjo means a minimum of 40% has been shaved away. However, top daiginjo can use rice that has been polished to only 30% of its original size. The polishing step is important because the most refined delicate flavors of sake are found in the starchy center of the rice. The outer layer of sake rice is predominantly fats, proteins and minerals, which can contribute to harsh or off flavors in the sake. Thus the most expensive sakes will often be highly polished so that only the heart of the rice is used. Figuring out the label is just the first step. One of the most important information about sake is in the small print on the label, the nihonshu-do, or sake meter value. This reveals the sake’s sweetness level, which can range from -5 (sweet) to +12 (very dry) with +3 to +5 being the norm. Most sakes for export will provide the sake meter value which is a standard measurement. For those who prefer sweeter styles, go for sakes with 0 to -5 nihonshu-do; if dry styles are preferred then go for +3 to +7. What I find most interesting in the sake label is the aminosan-do (amount of amino acids in the sake). This indicates the level of amino acids in the sake, which is basically the taste of umami, the fifth flavor discovered by a Japanese professor about a hundred years ago. The food industry has been aware, and has used this term for decades and it is finally making its way into wine vocabulary. This umami taste is the detection of amino acids called glutamates in food and wine. In sake, higher levels of umami contribute to fullness in perception and a richness and tastiness in flavor. In food, umami can add a roundness, a savory, meaty aspect that balances and marries together other flavors such as sweetness, sourness, bitterness, saltiness and spiciness. It is a naturally occurring flavor in foods like mushrooms, seaweed, tomato and double boiled soups. Artificial umami, monosodium glutamate (MSG), is extremely popular in fast foods where a dash of MSG can add a savory, rich character to the food. As a flavor, umami is everywhere in the world of Asian cuisine – all the fermented soy bean seasonings like soy sauce, oyster sauce, miso, etc is brimming with umami. Japanese food is all about umami – I can’t think of very many dishes where soy sauce or soybean-based sauces do not play a role. It is no wonder then that sake is filled with umami and that it is measured as an ingredient in sake, Japan’s most traditional alcoholic beverage. The standards for evaluating sake are different from wine. All the flavors of sake, including the very important umami flavor, are subtle and quiet. To be powerful and strong in any of its elements is to be faulty or unbalanced. 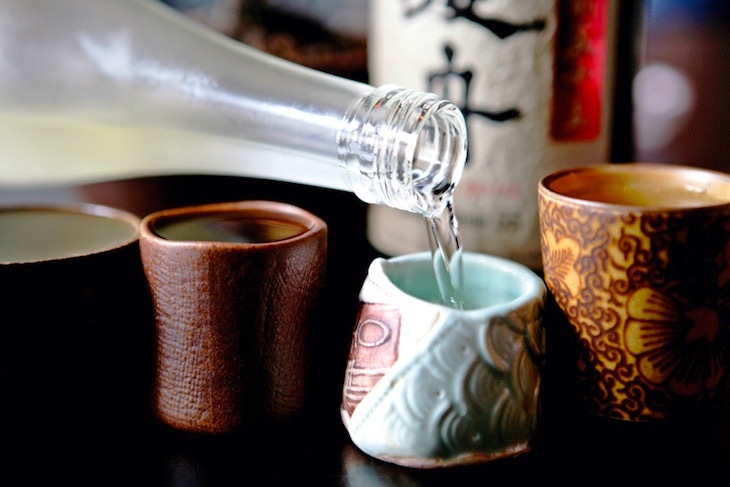 The quality of sake is more about balance, subtlety, lingering finish and harmony among its delicate flavors.